1. Follow or like ‘PlantSomethingBC’ on Facebook, Instagram, and Twitter. 2. Plant your favourite bee forage plant or have an certified landscaper plant them for you. 3. Capture your gardening experience and show us what Bee Forage plants mean to you on Facebook, Instagram, and Twitter using #BCplants. 4. 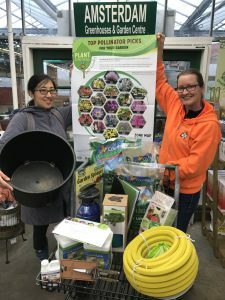 Win a grand gardening prize worth $100. A grand gardening prize? Tell me more! 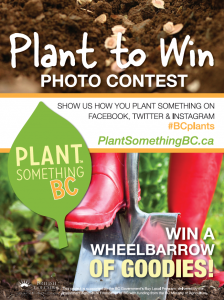 For every video or picture that you post with the #BCplants hashtag you are qualified for a Gardening Prize worth $100. Let your creativity run wild, and show us what you’ve got! Psst… capturing a bee, butterfly or hummingbird in your picture will get you more points. Use a strong message that relates to gardening or buying and planting locally grown bee friendly plants for a strong social response. Turn your privacy settings onto public so the world can see your posts, and most importantly to make sure that Plant Something BC can see your posts. The more your pictures are liked, favourite, retweeted, and shared, the better your chances are to win. Enter as many times as you would like. The more entries that you submit, the more chances that you have to win!